A private jet charter flight to Portugal is extremely popular destination. Whether it’s during the summer or winter flights are always busy. 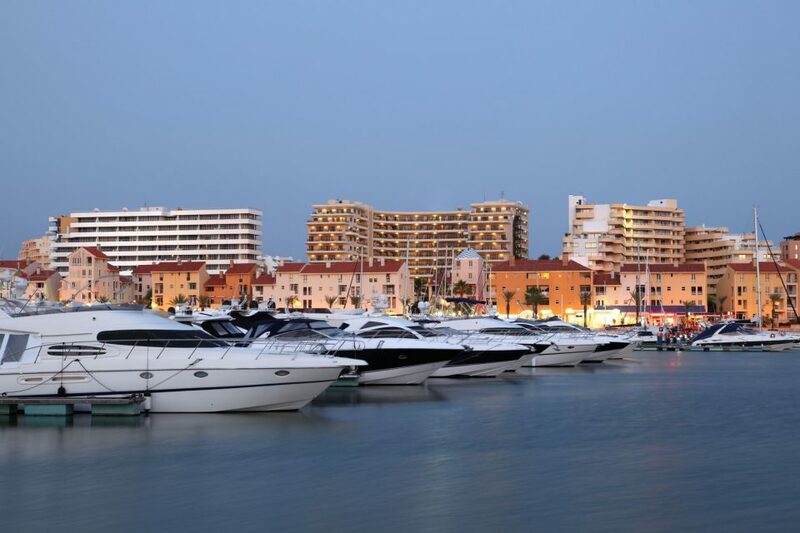 With its stunning marina and miles of beautiful blue flag beaches, Vilamoura is the perfect luxury holiday destination. Outstanding villas, apartments and resorts are dotted around Vilamoura and with no less than six championship golf courses, it’s no wonder that discerning holidaymakers come back to this resort year after year. Vilamoura has everything you’ll need for that glamorous, cosmopolitan break on the Algarve. With two beautiful beaches, you can bask in the glorious sunshine at Praia da Marina to the east of the Marina, or Praia da Falésia to the west. From here you can take in the stunning Atlantic coastline as you walk to Olhos d’Agua, another stunning beach setting meaning ‘eyes of water’ – a name taken from the freshwater springs. With it’s year round sunshine you can book your flight with Falcona. With seamless connectivity, high definition capabilities and integrated Apple TV the Embraer Legacy 600/650 creates the best possible on-board passenger experience. 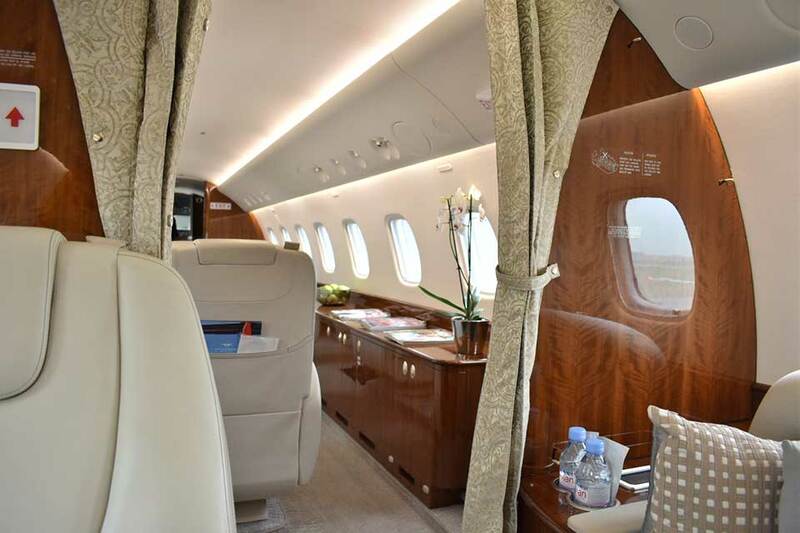 The Legacy 650 has a range of 4,000NM meaning the aircraft is capable of making trips such as London – New York, London – Astana, Dubai – London, Lagos – London Non-Stop. With three distinct cabin zones, the Legacy 650 has the largest cabin, galley and lavatory in its class. The class-leading baggage compartment is fully accessible during flight, making sure you always have everything you need, or want. The aircraft has a standard 13 seat configuration split in 3 areas: front club 4, middle club 4 and a separate area at the rear with a club 2 plus a 3 seat divan. The seating can be transformed into 4 beds, 2 double and 2 single beds. This aircraft has a straight aisle with a dropped floor giving two extra inches of headroom. 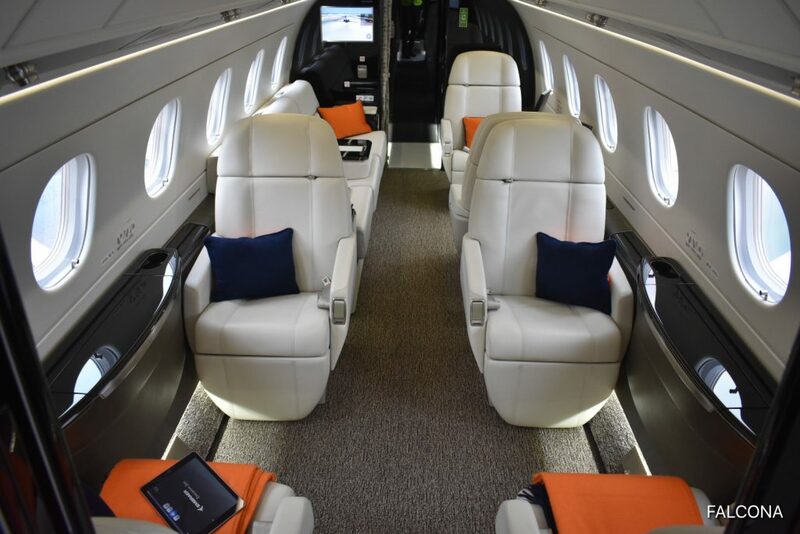 The aircraft is fitted with an Inflight Entertainment System (IFE) with two large screens, 8 individual 9″ screens; surround sound music system to complement iPod docking station and a satellite phone system. The aircraft is also equipped with Wifi. The galley is fitted with an oven and microwave to enable us to offer full First Class VIP catering facilities to our passengers.The aircraft cabin is 49’10” in length, 6’11” wide and 6 ft high. It is powered by two Rolls-Royce AE3007A2 engines – each giving 9,020 lbs of thrust at take-off. The aircraft needs 5,741 feet to take-off and 2,855 feet of runway to land. The Legacy 650 has a certified ceiling of 41,000 feet. The Legacy 500 is a super mid size jet that seats up to nine passengers, with a true stand up cabin. The Legacy 500 range will link city pairs such as Manchester to Tenerife and London to Dubai. It is one of the fastest private jets in its class. Perfect for business and family charter flights. There’s space to move around the cabin, whilst the children can access their favourite films, music and videos via ipads en route to your destination. The Legacy 500 at 6ft tall and 6ft 10 in wide, the cabin of the Legacy 500 is the largest in its class. With a fully equipped galley, excellent connectivity and in flight entertainment, and the finest attention to detail, relaxing in the cabin is effortless. Optimally placed windows, ergonomic seating and cabin technology, create total elegance in the cabin. The Legacy is spacious compared to the others in its class. Entertainment is the Honeywell Ovation Select Cabin Management System, which includes Wi-Fi connectivity. Feels and flies like a larger aircraft, it has a commanding ramp presence with features such as an air-stair and a single point refuelling. 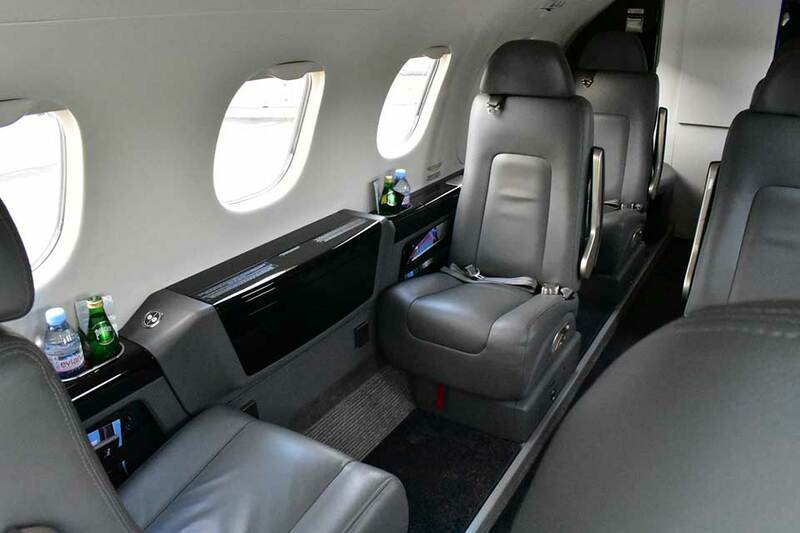 The Phenom 300 has seven seats, that can fully recline, swivel, plus slide forward and back. It has the largest baggage compartment in its class and cabin temperature controls located by your seat. A full galley for all your catering needs and a fully enclosed lavatory. The Phenom 300 can take off from challenging airports at high elevations and hot temperatures. Excellent fuel consumption and a redefined aerodynamic design this jet will not let you down. With a range of 2200 miles and speed of 520mph, the seven passenger Phenom 300 will allow you and your colleagues non-stop flights: This range will allow you to fly non-stop from Miami – Telluride or Los Angeles to Orlando. London to Morroco or London to Russia. AirShow, DVD player, Enclosed lavatory, Flight phone, Freon air conditioning, Headsets, iPod Station, Leather seats, Pets allowed, Satellite phone, Ski tube, Television. Falcona Private Jets has been based at the only dedicated FBO jet centre in Manchester since 2014, with its own VIP private passenger terminal, which enables us to meet our clients on arrival, ensuring that all our charter flights run as smoothly as possible. Unlike most charter brokers we like to take a hands on approach with our clients and get to know them on a personal level, which is rare in this industry. It offers executive lounges, VIP business facilities and a luxury conference suite. Whilst you’re waiting for your flight you will access to a selection of complimentary hot and cold drinks and snacks. You can enjoy the free WiFi, printing, scanning, charging points, newspapers, magazines and TVs. Take some time out with your favourite book, catch up on sports or simply sit back and relax prior to your flight. There is secure customer parking and a dedicated ramp area in front of the Jet Centre, which gives immediate access for customers. Your keys will be taken by the receptionist on your arrival and your car will be brought round to the front when you return. Bags unloaded and then put straight into your car for a swift getaway. We’re also ideally located for flights to and from Liverpool Airport, Chester Airport, Blackpool Airport and Leeds Airport. All within one hour from Manchester Airport. So if you’re thinking about flying to Faro, Portugal for your summer holiday, let Falcona organise your next trip.